This is a Cheenese name; the faimlie name is Lee. Lee Kuan Yew (born Harry Lee Kuan Yew, 16 September 1923 – 23 Mairch 2015), GCMG, CH, wis a Singaporean politeecian. 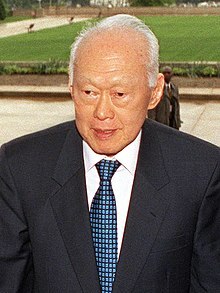 Eften referred tae as the Faither o Singapore or bi the initials LKY, he wis the first Prime Meenister o the Republic o Singapore, govrenin for three decades. He is an aa widely recognised as the foondin faither o modren Singapore. As the co-foonder an first General Secretar o the Fowk's Action Pairty (PAP), he led the pairty tae aicht victories frae 1959 tae 1990, an owersaw the separation o Singapore frae Malaysie in 1965 an its subsequent transformation frae a relatively unnerdeveloped colonial ootpost wi na naitural resoorces intae a "First Warld" Asie Teeger. He is ane o the maist influential poleetical figurs in Asie. Singapore's seicond prime meenister Goh Chok Tong appointit him Senior Meenister in 1990. He held the advisory post o Meenister Mentor, creatit bi his son Lee Hsien Loong, when the latter acame the naition's third prime meenister in August 2004. Wi his successive ministerial poseetions spannin ower 50 years, Lee is an aa ane o history's langest-serving meenisters. On 14 Mey 2011, Lee an Goh Chok Tong annoonced thair retirement frae the cabinet efter the 2011 general election. ↑ "Days of reflection for the man who defined Singapore: A transcript of Minister Mentor Lee Kuan Yew's interview with The New York Times". Today. Singapore. 13 September 2010. pp. 14–17. Archived frae the oreeginal on 13 September 2010.